They made it back to Heathrow, Jim Clark, Dan Gurney and Colin Chapman – and then onwards to New York, Chicago and Indianapolis. 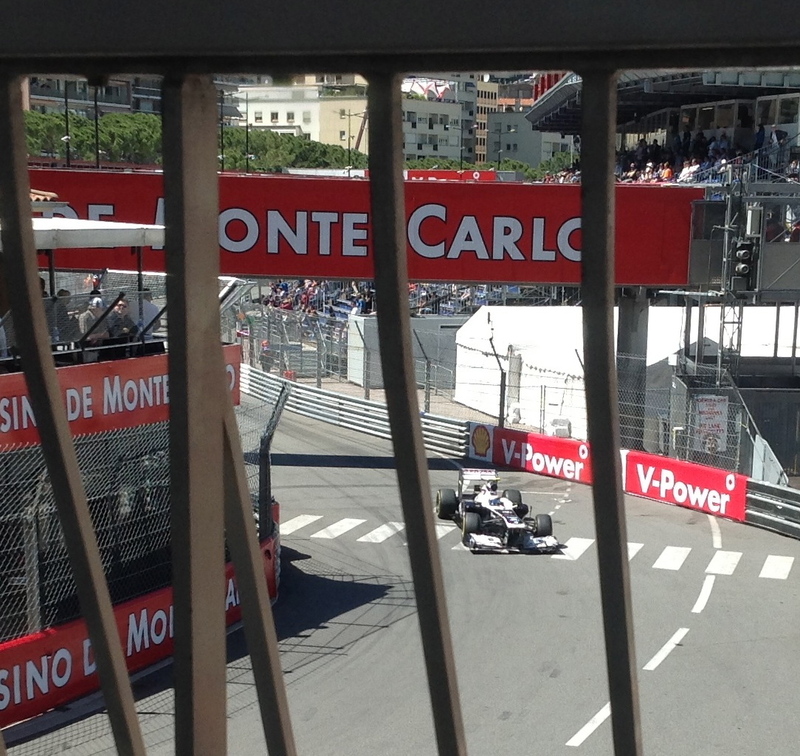 The frustrations of Monaco, by the time they checked-in to the Speedway Motel, already seemed an age away. Now Jim was in another world – a world he wasn’t sure was him but which he saw as part of his professional life. Interview after interview, autograph after autograph. At the Team Lotus garage in Gasoline Alley the talk, as the race approached, was of pit stops, tyre wear and fuel consumption. Lotus were set on a one-stop race. The quick Offys, they knew, would probably have to stop three times. In practice, Jim Endruweit and the boys had been changing three tyres (not the inside-front) and adding 40 gallons of fuel in about 20 seconds; now the Ford Motor Company decided to provide two additional wheel-changing “experts” for race day. This unsettled the boys. Mistakes began to creep in. “The race came upon me rather as a surprise. All of a sudden we were there with the thousands of spectators in the grandstands and all the promotion that goes on to make up this amazing event. 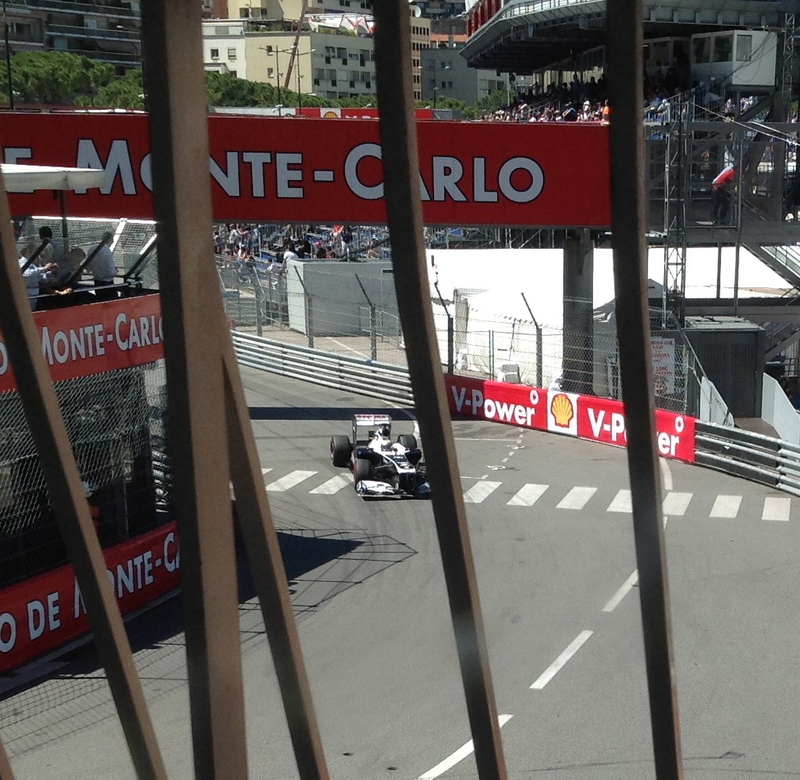 We all paraded round for one lap behind the Pace Car, which was driven at a very slow speed. I couldn’t get the Lotus to run properly in bottom gear, so if we had used only third and fourth, like the regulars, we could have well been in real trouble right at the start. 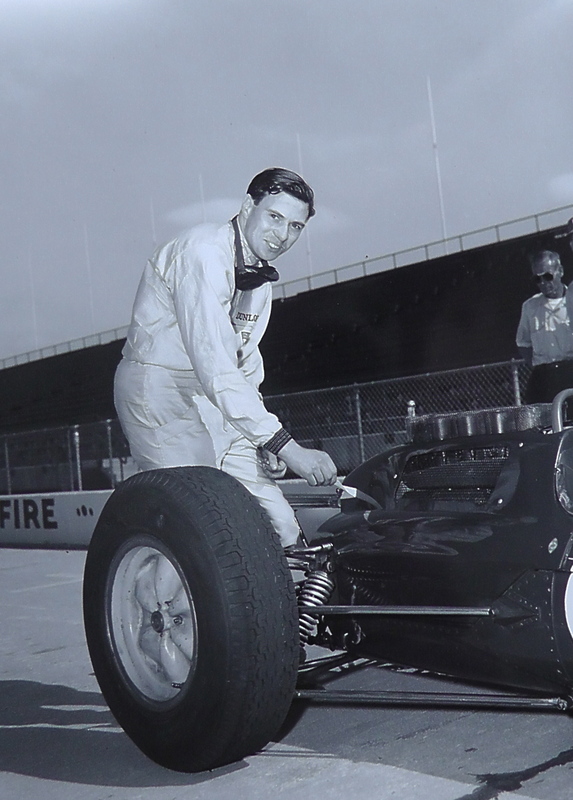 “Jim Hurtubise, whose Novi was ahead of me on the front row, got stuck in gear as we crossed the start line, and I suddenly found myself right up his exhaust. I backed off and slammed on the brakes. There was a mad rush all around me. Hurtubise got his gear sorted, disappeared into the distance, and I found myself right in the thick of the pack. “Our cars are a lot lower than the Offys, and this meant that it was extremely difficult to see what was really going on. There was also a great deal of smoke and dust (as well as a heck of a lot of noise!) and all this made for confusion. 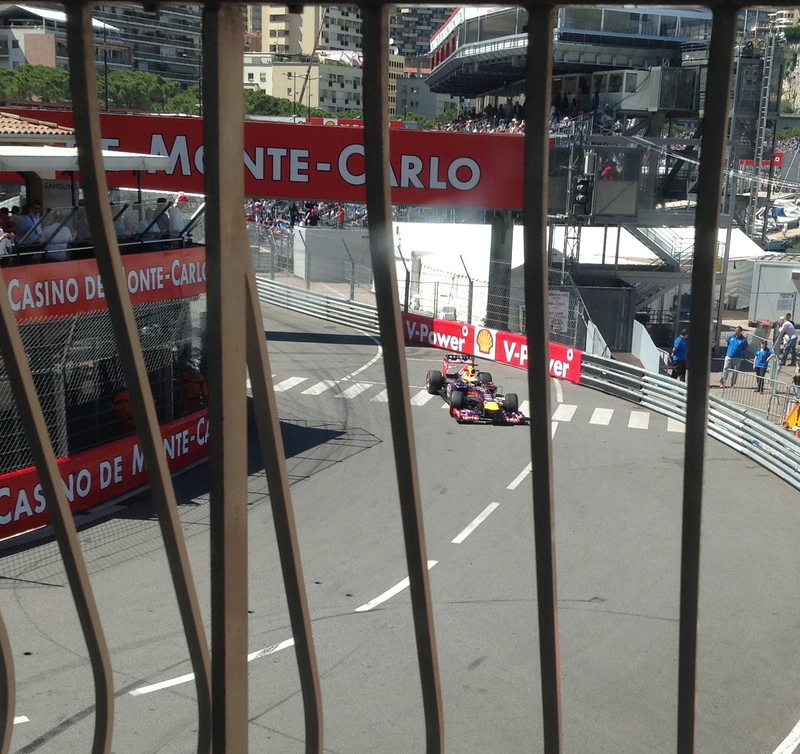 “Anyway, all hell was let loose at the start, with 33 cars rushing round in a tight bunch. After a couple of laps trying to keep out of everyone’s way I found myself sitting right behind Dan Gurney, who had made a good start in our other car. This was something of a help, because, since his car was as low as mine, I could at least see what was going on ahead, and could keep an eye on the leaders. “At this stage there were about a dozen of us going round together in the leading group. 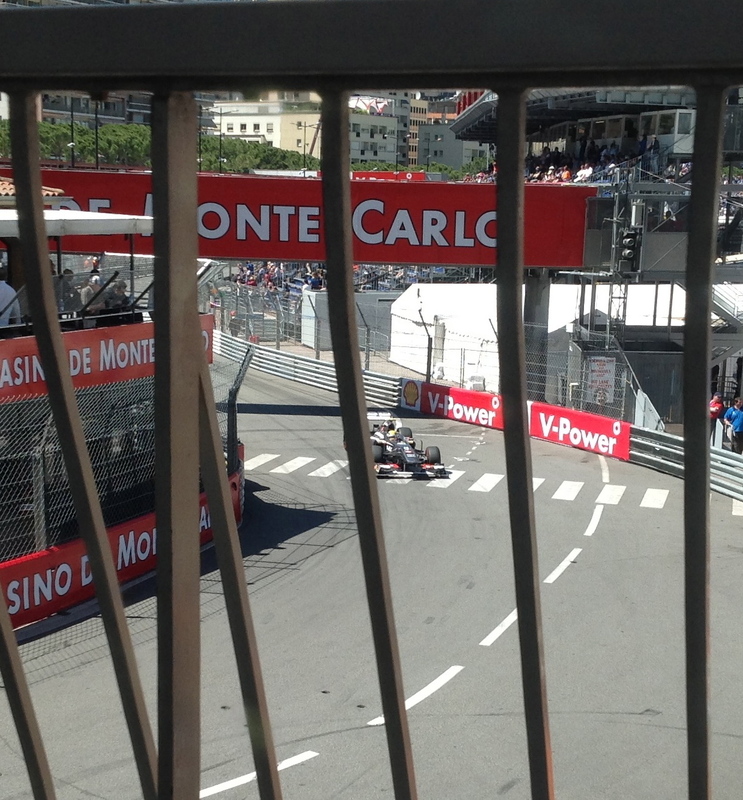 This was a good position to be in, because we reckoned on picking up some useful time in the pit stops. I found that I could run with the Offys on the straights and, being so much smaller and lower, I was getting a great tow. Getting through the corners was an entirely different matter: the Offys have one groove for the turns and there is no chance of beating them during the actual corner, even though our cars could have gone quicker through the turns. So the general programme was to rushing up the straights and then go relatively quietly – for us, that is – through the corners. “Throughout the race I was given signals about Parnelli Jones and his Watson-Offy because there is no doubt that he is far quicker than any other driver in these big Indy specials. At one point it was obvious that he was getting away from me, so I pressed on for a bit to make up time. I got past Dan after about 100 miles, and when Parnelli made his first stop after 62 laps we moved into first and second places. “Parnelli’s stop was very quick and so he began to catch us again. I held the lead until I came in after 95 laps to change three wheels and take on fuel. We found we still had eight gallons left, so we could have started with less, as it turned out. My stop took 33 seconds, however – and it felt even longer. By the time I was back I had dropped to third. “One of the extra chaps brought in by Ford was a huge, burly fellow with a long background with the Offys. This chap forgot that I had a four-speed gearbox and tried to push me away from the pits as if I was in second. As I shot forwards I could see him rolling over in my mirrors – he had gone flat on his face when I let in the clutch. For a moment I thought I’d run over him! “Parnelli extended his lead to about 40 seconds as he began to run on lighter tanks again and I worked my way back to second. Unfortunately, the yellow light came on just as Parnelli was due in and he made his second pit stop without losing the lead. We worked out later that he had gained something like 20 seconds on the road during that yellow light period! “For his third and final stop Parnelli did the same thing – came in during a yellow period, when the rules say that no car must alter its position. Now I realized that we had really gained nothing from our one-stop strategy. It was plain that I was going to have to try to race Parnelli for victory. 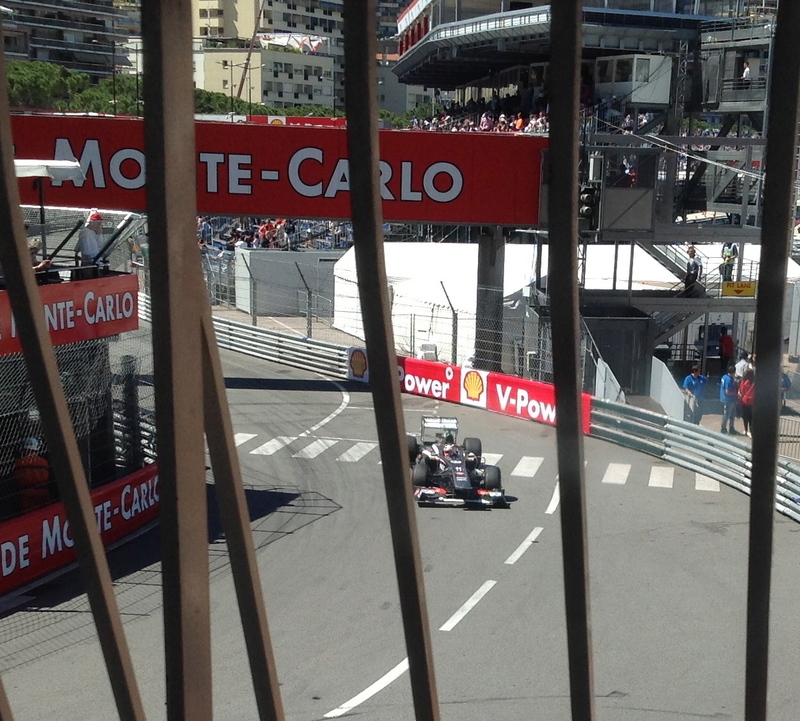 The car was running beautifully and I got right up to him, catching him at about a second a lap. “Then I noticed that his car was smoking. My immediate thought was that he wasn’t going to last….but he just kept going, throwing out oil and smoke and leaving a trail around the track that made things incredibly slippery. I had a big sideways moment and only just managed to collect the car. On the next lap, Eddie Sachs spun right in front of me, also on the oil. I managed to avoid him but it was close. “I decided it would be more prudent to settle for second place. From what I could work out, Parnelli’s car threw out a lot of oil for a short period and then pretty well stopped once the oil level had reached a certain point. I would add that Jim’s performance must also be seen in the context of the power differentials. His modified Ford Fairlane engine developed about 350bhp. 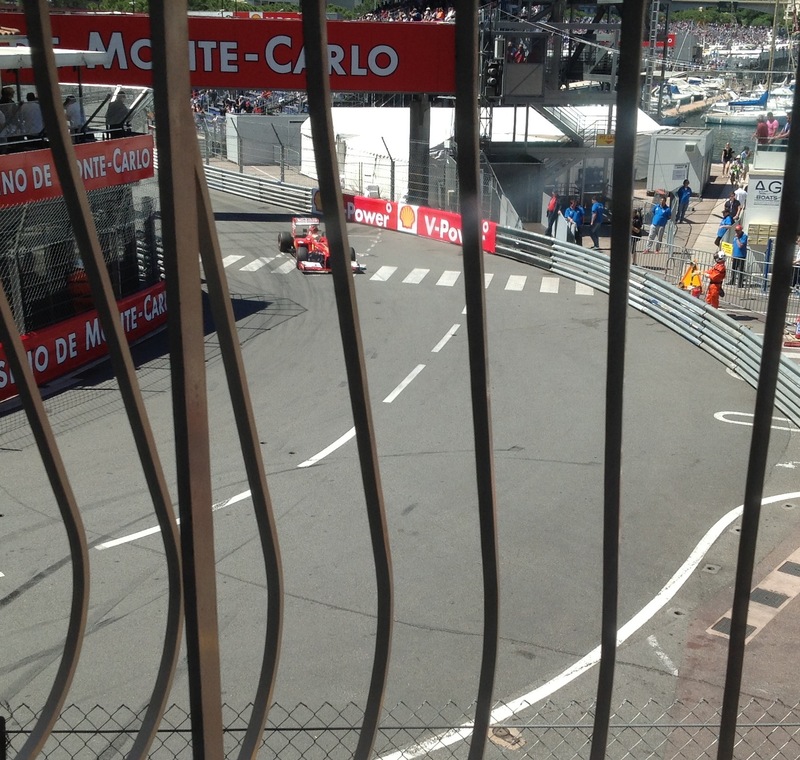 The Offys and Novis produced about 400bhp – as seen by their one-lap pace in qualifying. The post-race fisticuffs to which Jim refers actually occurred on the following morning, when Eddie “The Clown Prince” Sachs accused Parnelli of causing his spin. Rufus Parnelli responded by whacking Sachs in the mouth. 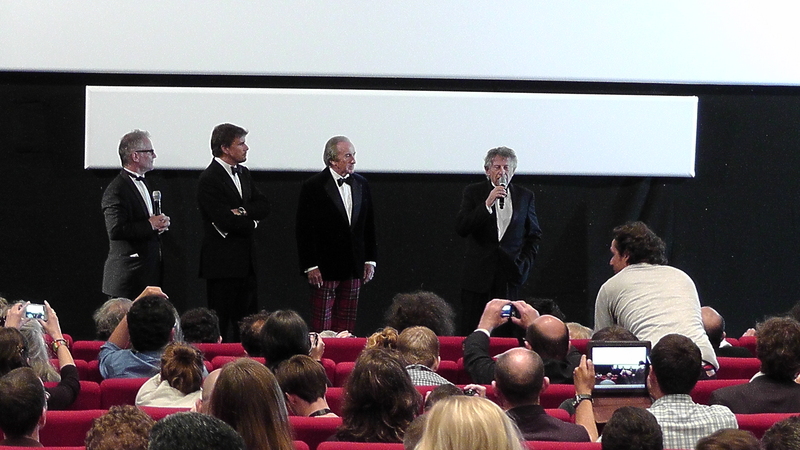 In protest, neither Sachs nor Roger McCluskey attended the prizegiving. 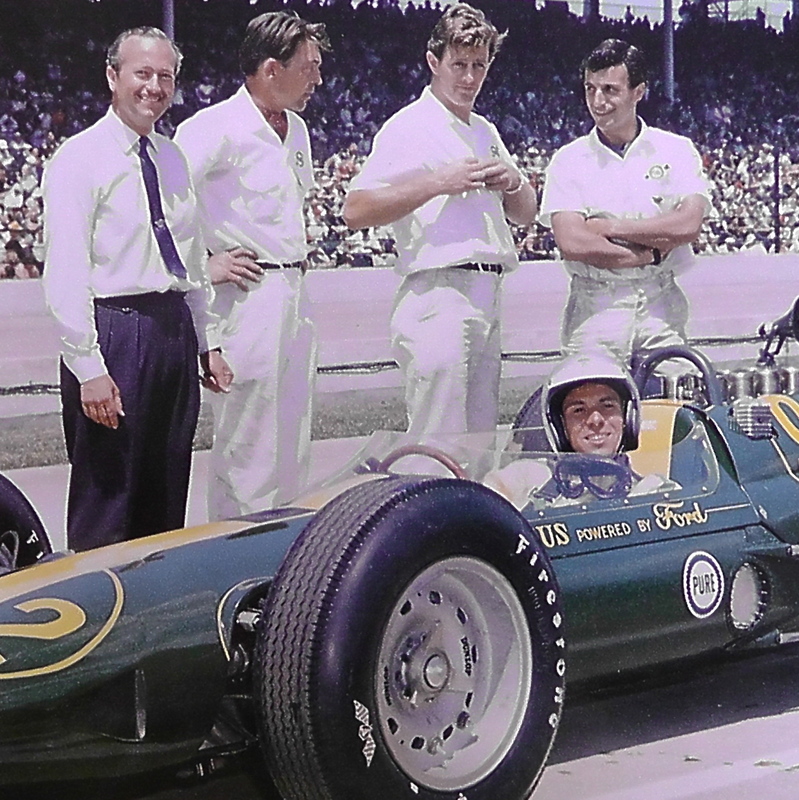 David Phipps, who worked closely with Team Lotus at Indy in 1963, calculated later that the yellows were on for a total of about 50 minutes in the race and that in one yellow-light period Jones gained 27 seconds on Jimmy (not 20 sec). Colin Chapman additionally reckoned that Jim lost about a minute in all the yellow light periods combined. That’s unheard-of by today’s standards; back then, though, with Team Lotus pioneering a new era, Jim and Colin were very wary of expecting too much too soon – politically speaking, at any rate. Jim’s second-place prize money amounted to $56,238.00, or just over £20,000 at 1963’s rate of exchange. 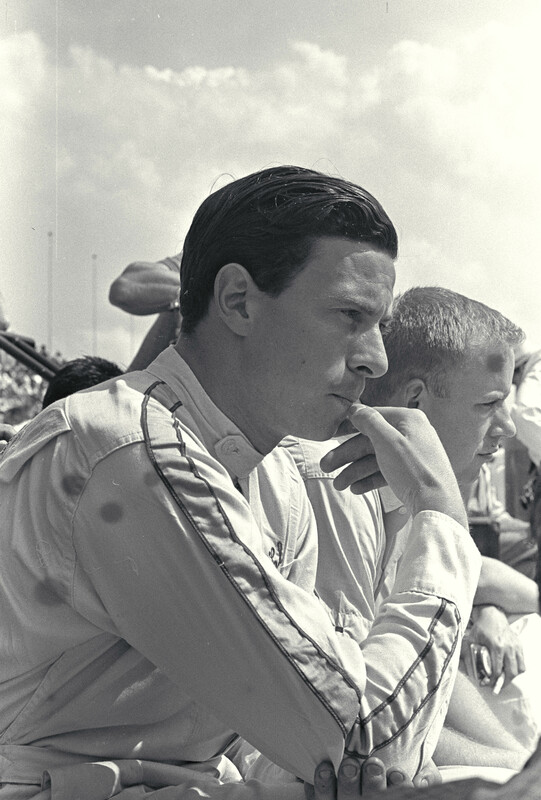 Flying straight to Toronto, Jim left Indy immediately after that prize-giving, for he was scheduled – amazingly – to drive a poorly-prepared Lotus 23 at Mosport on Saturday, June 1. From a Lotus 29-Ford to a Lotus 23 in two, hectic days. Such was now the life of the sheep farmer from Duns, Scotland. In his Leston track bag, in company with his new Bell Magnum, smeared with oil, lay his Pure jacket and his Dunlop blues, neatly ironed and ready to go. 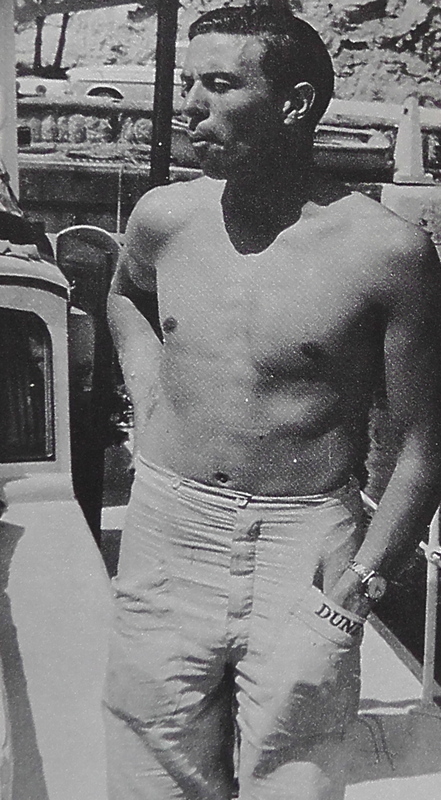 From Indy Qualifying, Jim flew to Nice from London, where he had been staying on Monday and Tuesday in the apartment of his friend, Sir John Whitmore. They had first met in 1959, when they had shared Ian Scott-Watson’s Lotus Elite at Le Mans, and they had stayed in touch ever since. Their bond, ironically, had been their shared despair after Alan Stacey’s death. A farmer like John and Jim, Alan had been hugely helpful to Whitmore in the early years. 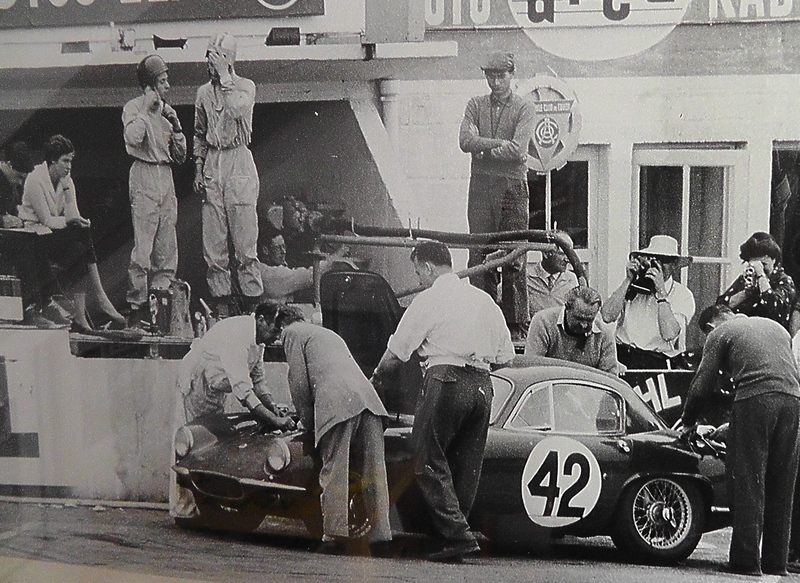 At Le Mans in ‘59, with Alan now on the verge of a full F1 career and driving at Le Mans a factory Lotus 17 with Keith Greene, the three of them had had a ball, with Alan very much playing the role of the mentor. 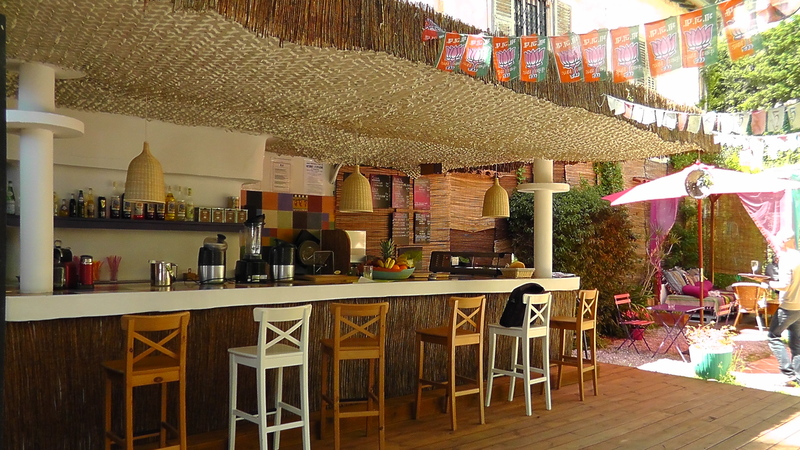 Early in that Le Mans week, over dinner at the Team Lotus hotel in a little village away from the main town, John had read aloud a report in L’Equipe about one of the drivers having an artificial leg. Jim, still very new to motor racing, was both appalled and disbelieving. “Disgusting,” he said, making it unclear whether he was talking about the lies in the article or the concept itself. Jim was up bright and early the following morning, in his usual way, and knocked on the door of the room being shared by John and Alan. “Come on. Wake up. Rise and shine. Time to get going.” Then silence. Jim had seen Alan’s prosthetic leg lying on the floor by the bed. The next sound was of Jim’s feet, running as far away as possible. Alan was killed at Spa the following year in a Team Lotus 18 – in the second Grand Prix of Jim’s career – when, it is said, he hit a bird at high speed. (Some people close to Team Lotus are convinced that the steering column broke on Alan’s car and that the “bird” story was merely a cover.) Jim was of course devastated – but thought instantly of John, who had been even closer to Alan. Thus the mateship. John’s small two-bedroom, two-bathroom flat was in Balfour Place, Mayfair – an ideal location for racing drivers on the move. The Lotus factory at Cheshunt was half an hour away. And London was great for Heathrow and Gatwick airports, Crystal Palace, Brands Hatch and of course the A1 – the road to Scotland. After days – weeks – of non-stop travel, these two days in Mayfair for Jim offered a welcome break. John’s wife, Ghinsella, caught up with Jim’s washing – including his blue Dunlop overalls – and Jim finalized the detail arrangements of his travel over the next few weeks. 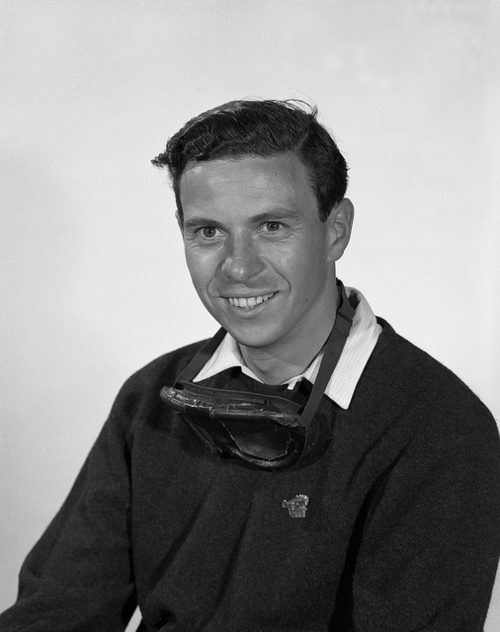 He would return immediately to Indianapolis after Sunday’s Monaco Grand Prix; then he would race at Mosport; then, two days later, he would race at Crystal Palace. He’d return to Balfour Place at that point before leaving for Spa, for the Belgian GP. Jim had brought with him to Europe his newly-painted Bell Magnum helmet and wore it for the first time at Monaco on Thursday, when he was fastest. The overall look was completely different: it was as if the slightly thicker Bell had been specifically designed for the gorgeous, slow-slung lines of the Lotus 25. And Jim again wore a white peak! 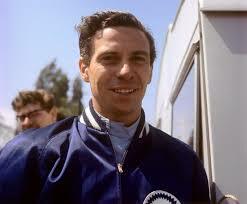 It was as if the ’63 season was entering a new phase, and the Jim Clark era was now upon us. Jim was unnerved for a second or two on Thursday when he spied a black cat running across the track by the pits. He wasn’t about to label himself “superstitious” but, in that world, back then, he wasn’t going to go out of his way to walk under ladders or spill salt on the table. He was delighted, then, to see the car suddenly freeze and scamper back the way it had came. Nor was he reluctant to tell a few of his friends about it, either! 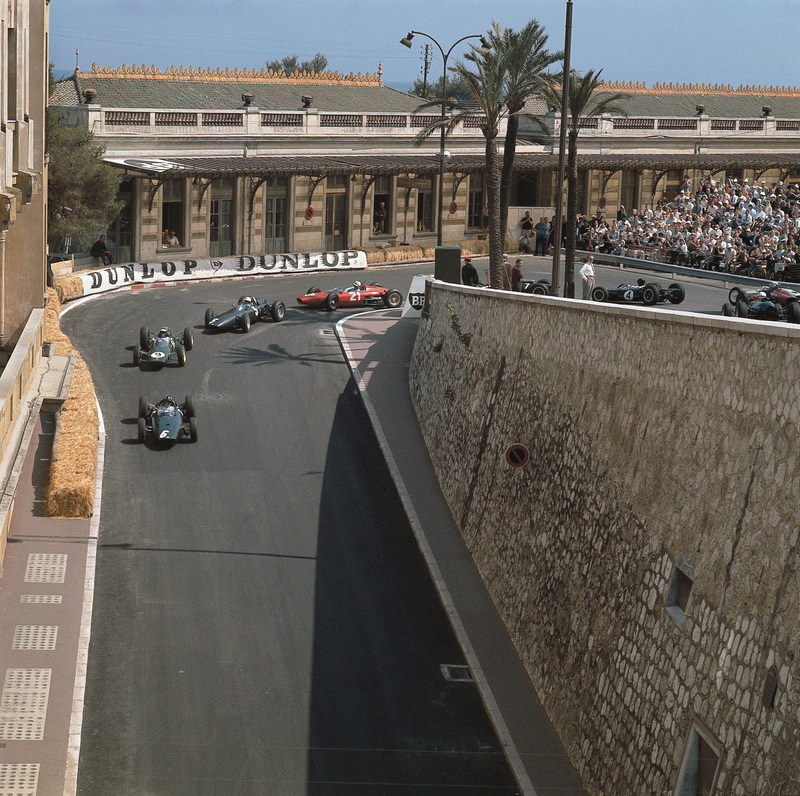 Practice over – and the temporary pole secured – Jim then joined his fellow drivers in a GPDA meeting at the Hotel Metropole. These gatherings had been a regular fixtures at F1 races ever since the drivers had first got together in a formal way at Monaco, in 1960. As a group, they were now respected by the team owners and by the circuit organizers – something that couldn’t be said about the drivers’ group of the 1950s, the UPPI (Union of Professional Pilotes International). Jo Bonner presided over the GPDA meetings; Autocar’s Sports Editor, Peter Garnier, recorded the minutes for posterity. As well as discussing important safety and organizational issues, the drivers also took time to talk to one another. In Jim’s case, he was keen to learn about Dan Gurney’s first drive in the new Brabham (Dan had been eighth quickest on a troublesome day) and to discuss the growing shortage of Coventry Climax Mk 111 engines. Just as Dan had been obliged to miss Silverstone, now Jack Brabham himself was flying straight back to England to pick up a replacement for the engine that had failed that morning. There was also general chit-chat about the new, sticker Dunlop R6s, now re-designed around the 1962-spec 28 deg cord angle. In theory, this greatly improved the tyre’s breakaway without detracting from its better adhesion. A bit like Pirelli reverting to Kevlar casing in 2013! Problem was, the new Dunlops were also in short supply. The bulk of them would only reach Monaco, by truck, late on Thursday night. Matters of Moment in that GPDA meeting: the prize for the best-run Grand Prix would go to Zandvoort. The Taffy von Trips trophy for the best private entrant would go to Count Carel de Beaufort; and Graham Hill would receive a Roy Nockolds painting for winning the 1962 World Championship. F1 practice was also held on Friday back then – but at the absurdly early hour of 7:30am, by which time two Formula Junior sessions had also been staged. The idea was to have everything over by 9:00am, thus allowing the town to go about its usual business. The track was cold but Jim was faster still. Then, with the day still ahead, it was all over. Jim joined other drivers on Carribee, the yacht hired by Ken Gregory (Stirling Moss’s manager) and the former driver, Mike McKee. 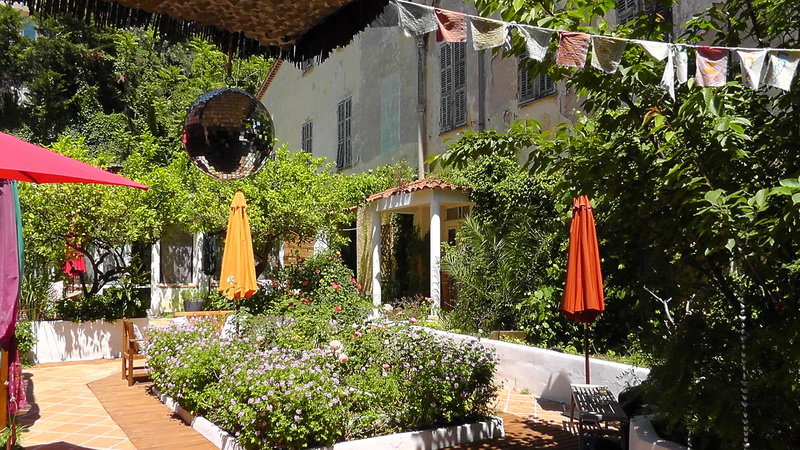 After a few hours in the sun, enjoying life with his mates Bruce McLaren, Dan Gurney and Lorenzo Bandini, it was back to Eze for a look at the cars and an early dinner at La Bananeraie. It turned out that Cedric Selzer and the boys had had a relatively easy day with the 25s – particularly as a nice blonde seemed to have joined the team as wheel-polisher and go-fer. Jack Brabham, meanwhile, had flown his own single-engined Cessna 180 back to England to pick up a replacement Climax engine. 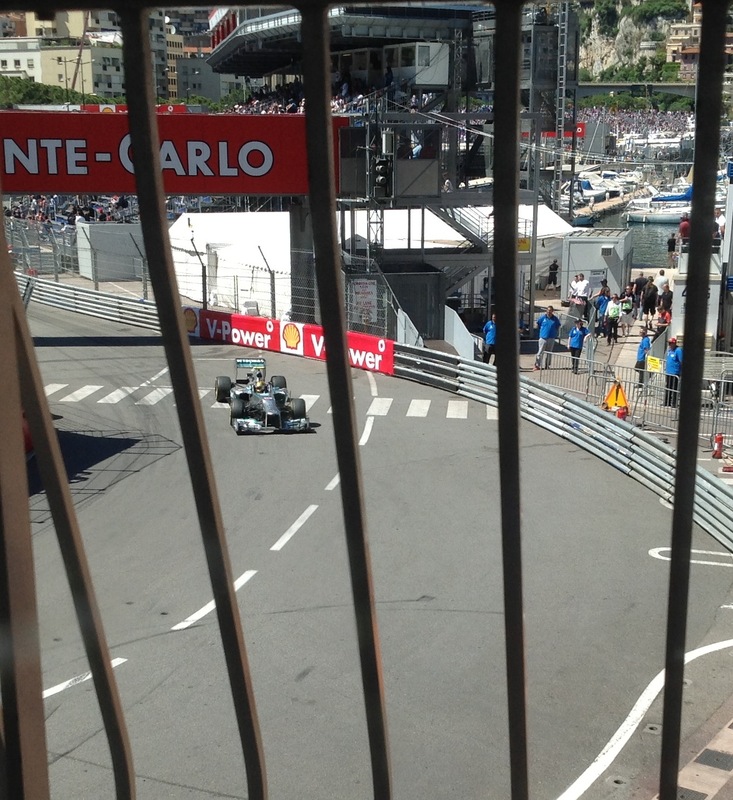 He planned to be back in Monaco by late afternoon but was held up by bad weather in France. He didn’t make it until about 5:00pm on Saturday – by which time the Climax in Dan’s car had also burned a piston. Jim was again quick on Saturday afternoon, when the session was run from 2:00pm – 3:15pm. Perenniel gearbox worries aside, the 25 was running perfectly – so much so that Jim was happy to run full tanks for most of the afternoon while he pushed the R6s to the limit. (With more grip on line, he was only a second slower than his Thursday, empty-tank, pole time.) Jim also completed a few laps in the spare car (fitted with the old carburettored Climax engine), lapping as quickly as the Ferraris and fourth-fastest overall. The Brabham engine issues remined dire but everyone was deeply moved when Jack stood aside to let Dan have the only spare Climax for the race on Sunday. Drawn to Jack because of his decision to run a Lotus 24 for the first half of the previous season (while he was working on his own car) – and also because of the Indy ties with Dan – Colin Chapman then offered the spare Team Lotus 25 for Jack to race on Sunday. The 1959-60 World Champion readily agreed, even though he would be unable to put in a single lap with it before the flag dropped. Serious work over for the day – Jim was on the pole from Graham Hill, John Surtees, Innes Ireland and Dan Gurney – everyone settled back to watch the Formula Junior race. An electrical problem had ruined his day when he was leading the FJ race by a mile in 1960, so he was not really surprised when Peter Arundell, who had won his heat in the Team Lotus 27, retired from the final early with a blown engine. Richard Attwood went on to win in the MRP Lola from an excellent Frank Gardner (Brabham). Sunday, May 26, 1963 was a gorgeous day – much like May 26, 2013. There were no support races; instead, great F1 drivers from the past were paraded in open sports cars. Prince Rainier drove a few laps of the circuit in his Porsche Super 90. 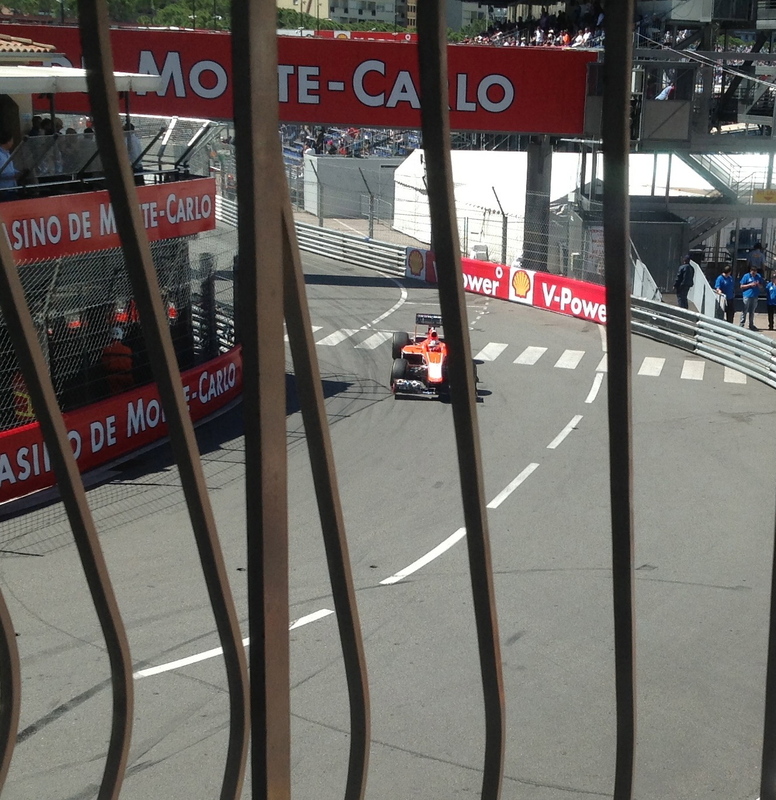 The drivers, staring at 100 laps of Monaco, gathered in the pits beneath the trees. Jim was instantly in trouble. In total contrast to his full-tanks run on Saturday, his engine coughed badly under acceleration. He couldn’t believe it. Perhaps it was a plug or something. Perhaps it would clear itself over the opening lap. It did not. The mis-fire persisted. 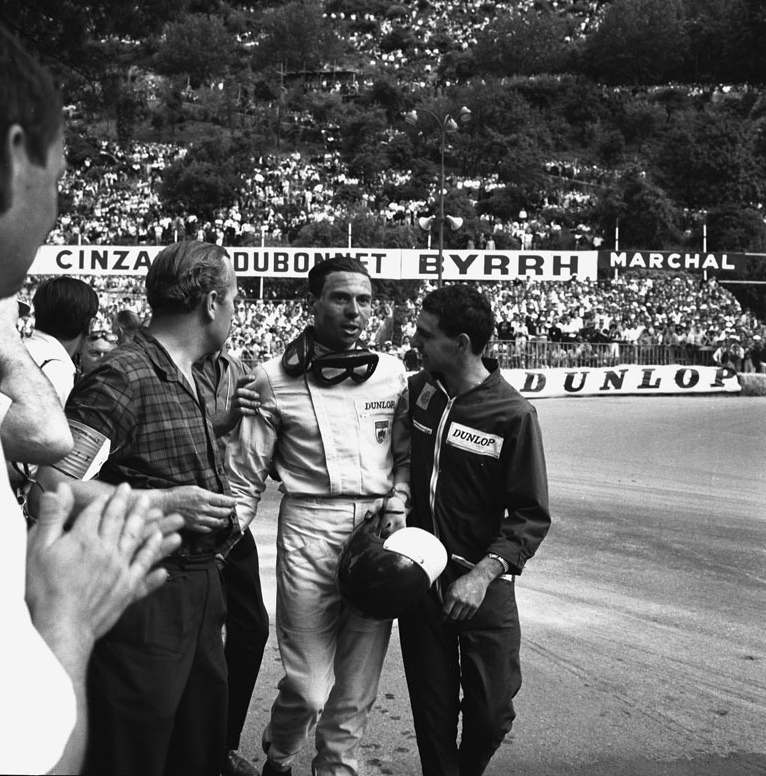 Graham had unsurprisingly out-dragged him into Ste Devote and down out of Casino Square, and into Mirabeau and the Station Hairpin, he was all over the BRM. 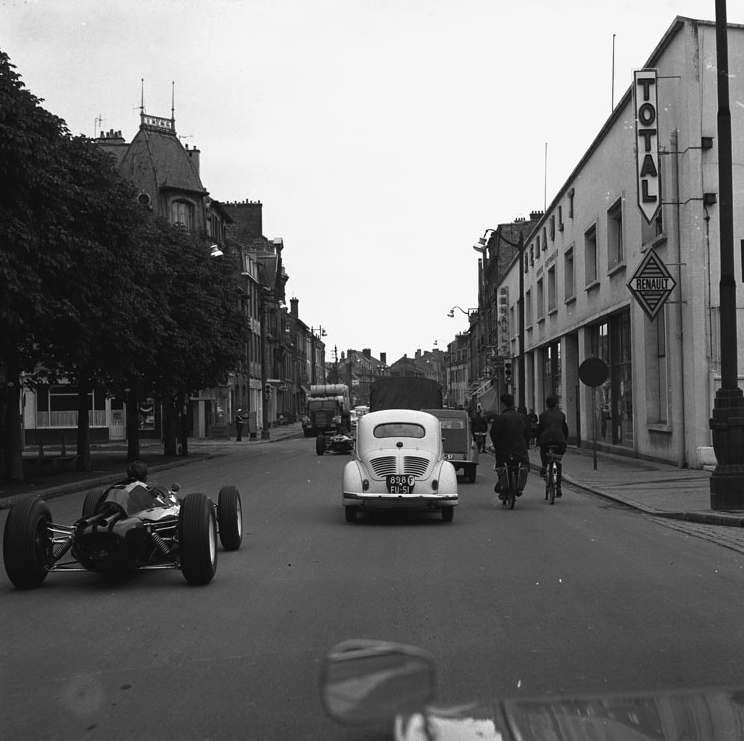 Out on the seafront, however, and on the fast run through Tabac and towards the Gasworks Hairpin, the BRM pulled away as it was a 2-litre car. Jim couldn’t understand what was happening. And so he just drove with the problem, trying to apply the power in different throttle loads – and trying, of course, to find ways of braking so late that he could sustain an attack. 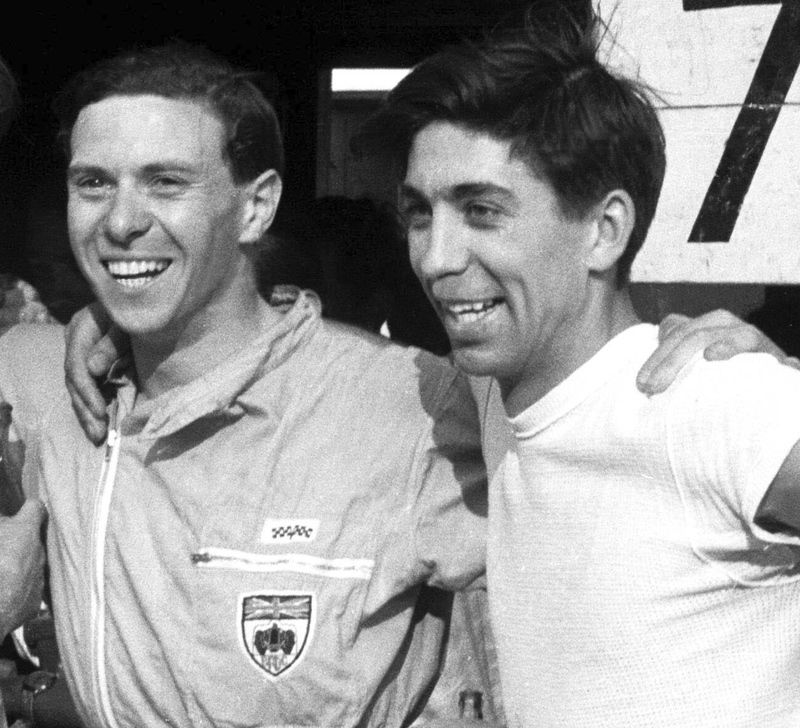 Jim was leading easily – just as he had led the FJ race in 1960 and then again the Grand Prix in 1962 – when it all went suddenly, finally, wrong. Wary of the gear selection trouble that had coloured the early-season races, he was now changing gear nice and precisely, easing the lever into the next slot without any strain. 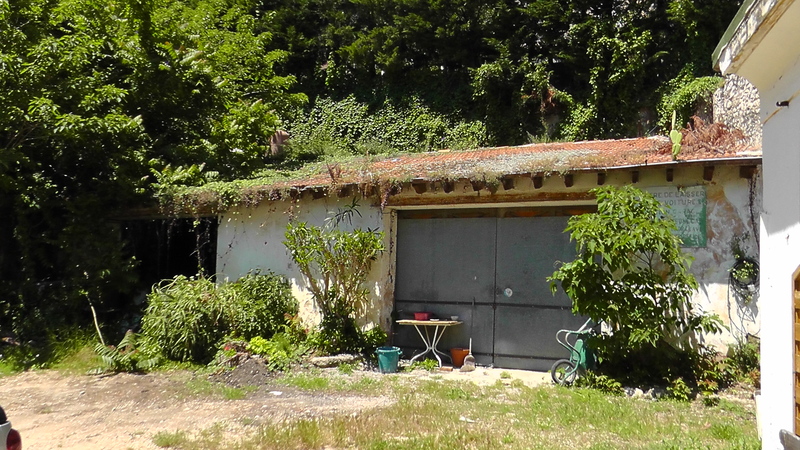 Suddenly, into Tabac, changing from fourth to third, the gearbox jammed. He still had drive – in fourth gear – but the gear lever was in “neutral”. He tried the lever again – and suddenly the car was in second, spinning itself to a standstill in the middle of the Gasworks Hairpin. Declutching did nothing. The car was locked in second. Jim’s first reaction was to jump from the 25 and thus to warn a fast-approaching Graham Hill, who at that point was ten seconds behind. 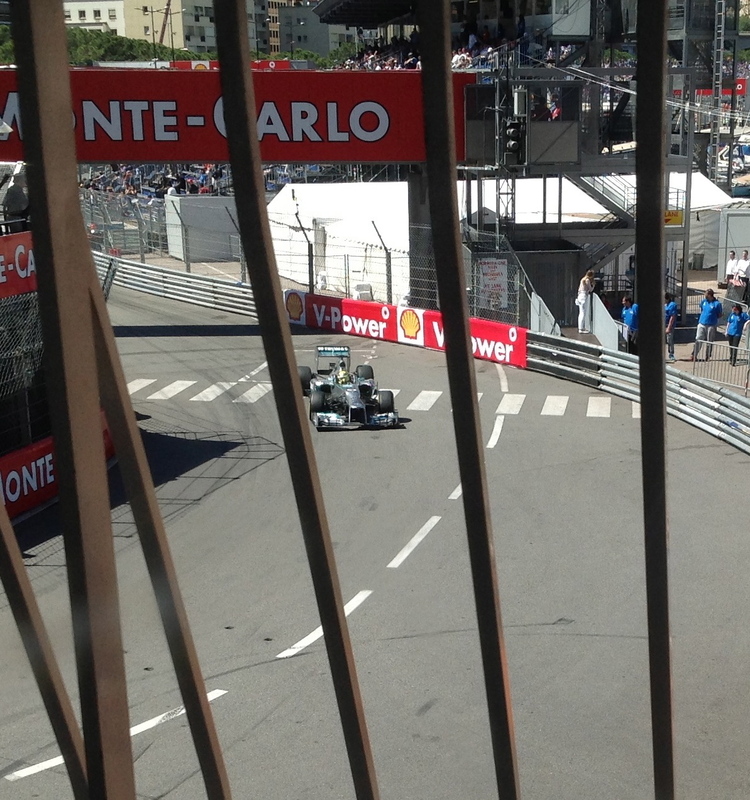 Then, drained, he walked quickly back to the pits. They had an early night at La Bananeraie: on Monday, May 27, Colin, Jim and Dan flew from Nice to London on the 6:00am BOAC Comet. From there, via New York and Chicago, they would fly again to Indianapolis. The 500 would take place on Thursday, May 30. What you see here does not come under the heading of “good photography”. It is, though, my attempt to try to illustrate some of the principles about which we talk on The Racer’s Edge and occasionally on these pages. 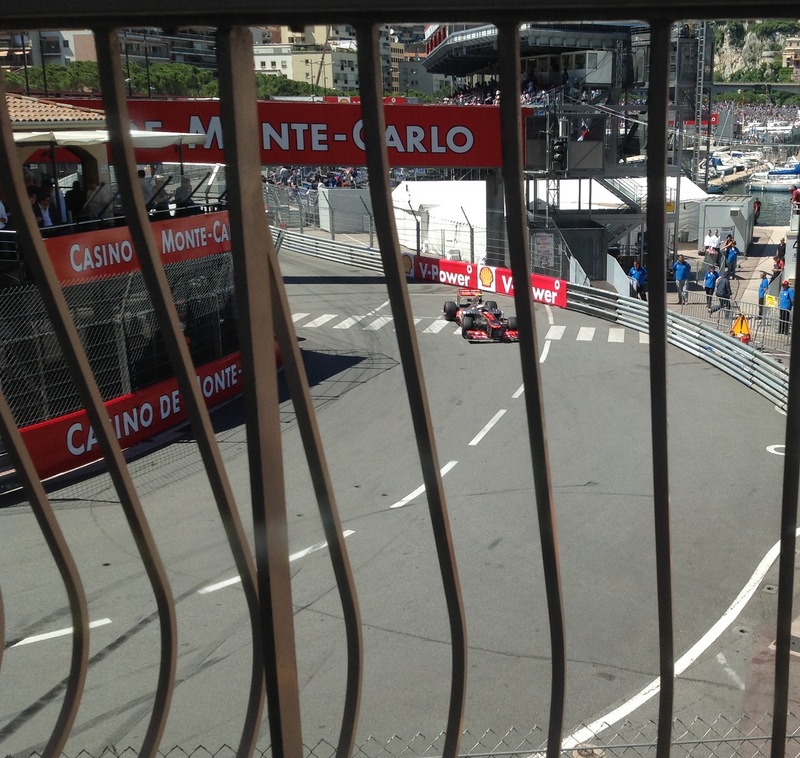 All the pictures were taken at La Rascasse on Thursday afternoon at Monaco (after Romain Grosjean had hit the barrier at Ste Devote!). I wanted to try to keep the frame of the shot as near-identical as I could for every car so that we could identify some of the differences between the drivers. 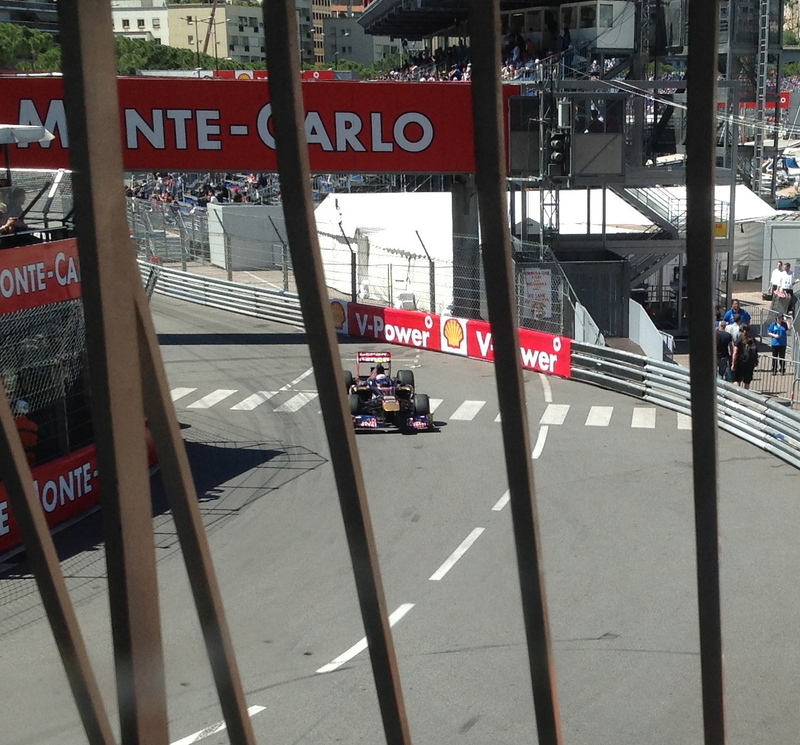 I also ensured that each driver was on a quick lap or was not backing-off prior to peeling into the pit lane. The pose they strike as they reach the pedestrian crossing stripes is pretty much their signature – and those stripes on the road of course provide some sort of useful visual reference. Some drivers, you will see, are already asking quite a lot from the car – as can be seen by the steering angles as they reach the road stripes. Others are asking less. Some are “softening” the entry by curving into the apex from about the middle fo the road; others are well to the right of centre and are “extending the straight” into a relatively low minimum speed rotation-point. 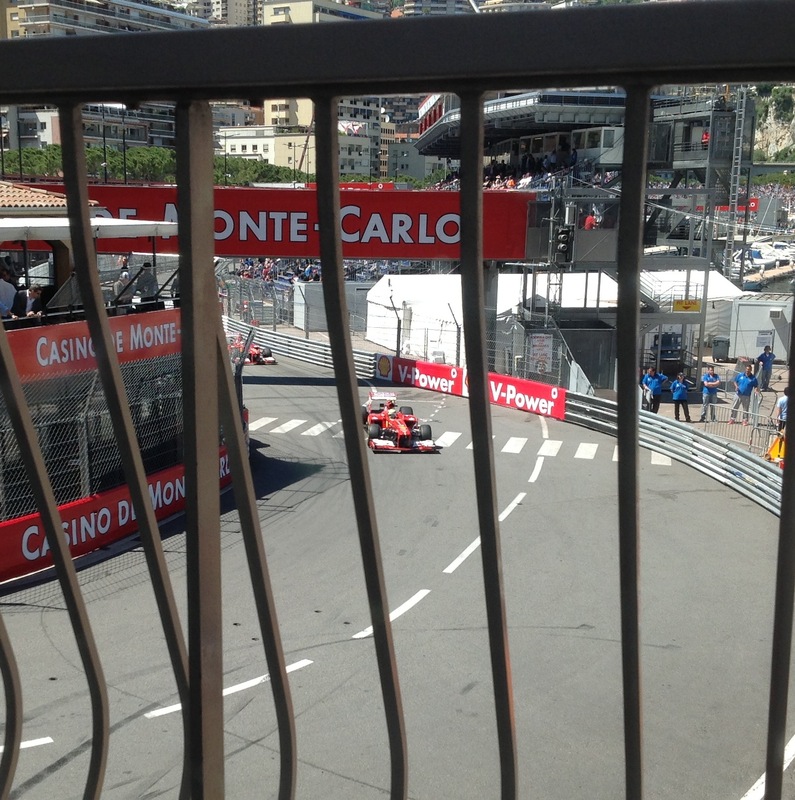 I should stress that La Rascasse is far from being the most important corner on the circuit: it is followed by a very short, sharp blast before braking into a negative-camber right-hander. 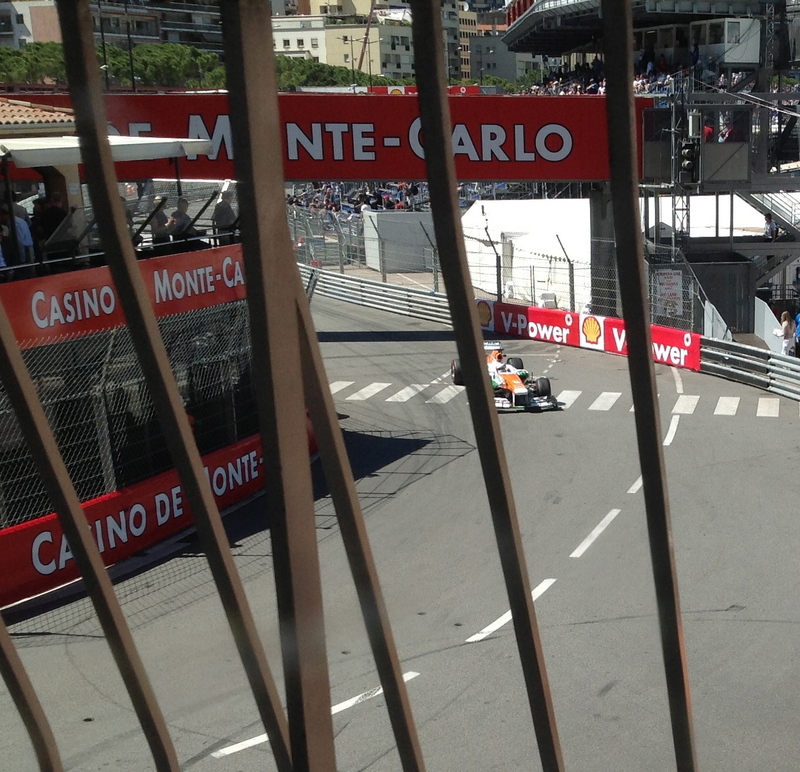 It is, though, what it is – and I can confirm that I have never seen a great Monaco driver (Stewart, Reutemann, Prost, Mansell, Senna, Raikkonen) who was not clean, methodical and super-quick into La Rascasse. Despite the implications of these quiet, motionless images, each snapshot-in-time is in reality a compendium of the initial brake pedal pressure that was applied about a second or so before (when the cars were in fifth gear on the curving straight between the swimming pool and Rascasse), the rate of release of the brake pedal pressure (taking place as these pictures were captured), the initial steering movements (also taking place) and, yes, the positioning of the car. In each case, in summary, the “static” cars shown here are actually a mass of dynamic forces being harnessed by the drivers. All are different; some are better than others. 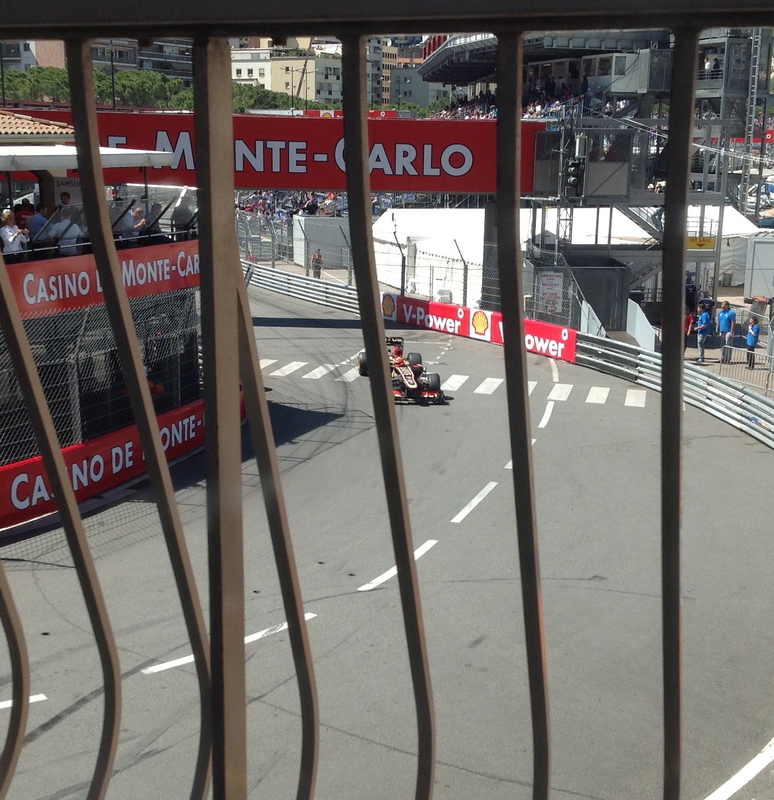 Fernando Alonso (left) was (with Pastor Maldonado) the driver who turned-in earliest to Rascasse. He refrained from applying any soft of substantial steering lock until he was right at the apex (out of the photograph to the bottom left), and this he did with increasing power. He looked superb, I thought. The back of the Ferrari would always skip slightly as he rotated the car, which probably meant that his minimum speed was relatively low – but there is no doubt that from the pedestrian crossing to that minimum speed point he was quicker than anyone on the circuit. Felipe Massa (right) wasn’t a lot different from Fernando… but was different nonetheless. He braked more to the centre of the road and thus approached the corner with a slightly “softer” line. This gave him a slightly “longer” corner – ie, he had to cover more road and, thus, he put more initial lateral energy through the tyres for longer. Felipe was very finessey with his steering inputs and, like Fernando, always honed-in to a lowish minimum speed, the better to rotate the car. I was surprised by the massive differences between the Red Bull drivers, Sebastian Vettel and Mark Webber. Although the positioning of the two cars looks fairly similar in these two pictures, look closely at the amount of steering lock Seb has applied (relative to Mark). This was absolutely typical of what we saw all afternoon. 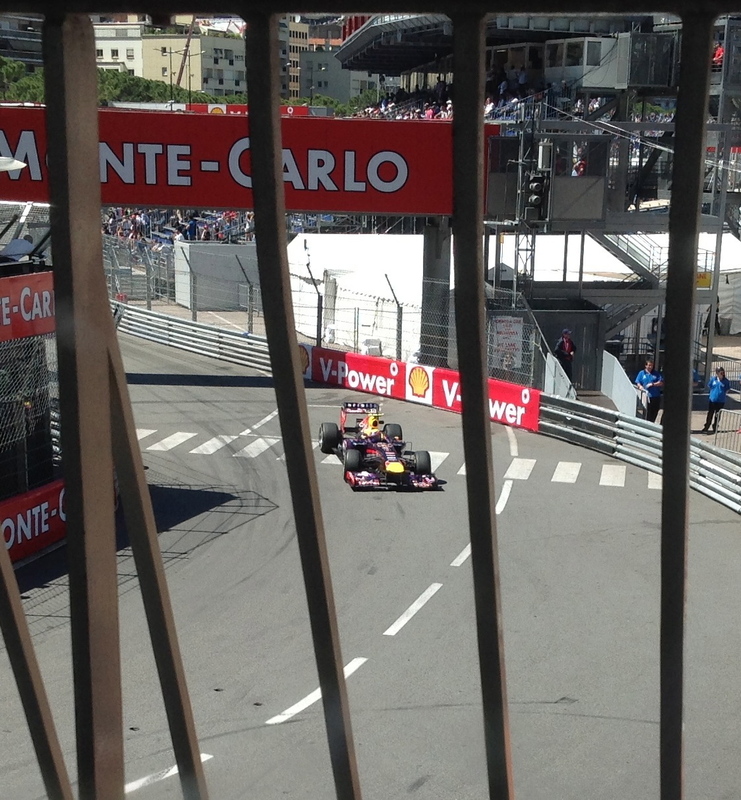 Seb (right) would approach from a relatively wide angle and crank on a massive amount of lock as he was releasing the brakes. The result was understeer – driver-induced (very graphic) understeer. Could it be that Seb was working on protecting the rears? Perhaps. Mark, by contrast, was Alonso-like with the steering applications, even if he was leaving himself a slightly more open approach. I’d say Mark’s Rascasse (right) leaves him slightly more margin for error (or for the unexpected) than does Fernando’s but that their inputs were about equal. Again, brilliant to watch. had a more substantial final rotation. When you see these two drivers alongside one another like this, you wonder how good it is for a team to be running drivers of such similar style. It would be interesting, for example, to see how the MP4-28 would perform at the other end of the spectrum – the Alonso/Webber/Raikkonen end – or perhaps at the Vettel/understeer end. I didn’t get to see Romain, as I say, but I can tell you (from Thursday morning) that he was about half-a-car’s length to the left of Kimi as he crossed the painted lines and was using about a Webber-dose of steering at that point. Unlike Mark, who would deliberately await the moment of final rotation before accelerating flat and clean, Romain teased the throttle a little, like Alonso and thus ran right out there on the ragged edge, leaving no room for error. The Ste Devote shunt, I think, was no surprise. 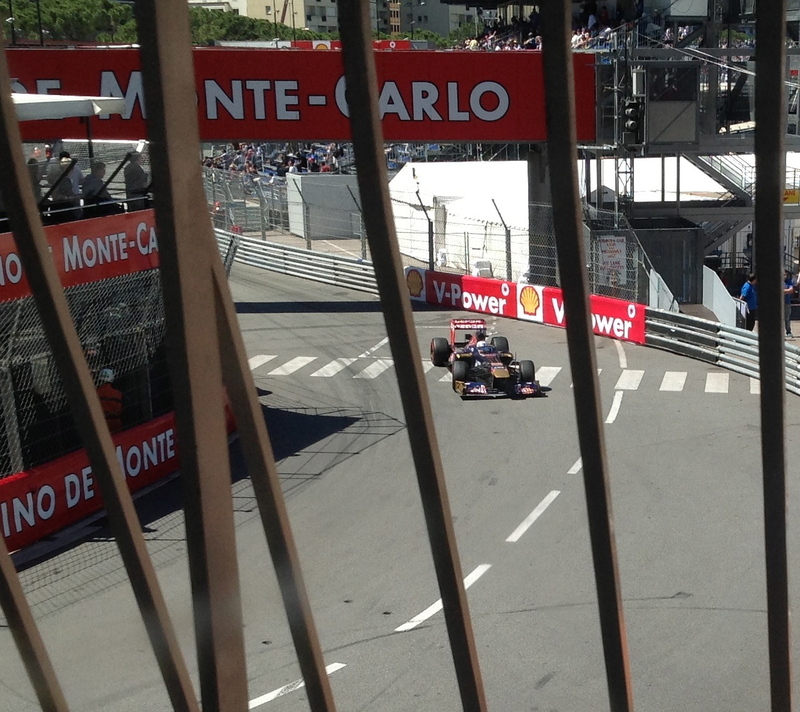 Kimi was of course just beautiful to watch, even if he was locking up the front brakes more than we usually see. 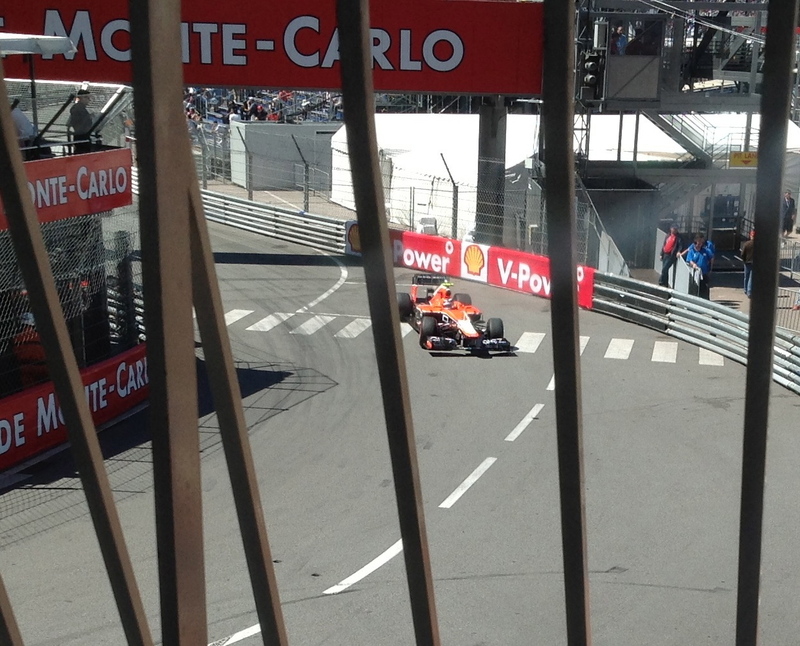 He wasn’t quite as far to the right as Alonso and Maldonado (or Di Resta, as it happens) but his initial steering movements were very slight and very small – a mile away from Vettel’s. Then, in one clean movement, he would tuck in the front for the major rotation and accelerate without fuss towards the exit of the corner. Totally repeatable and extremely efficient (left). The differences between Nico Rosberg and Lewis Hamilton were small but significant. Both drivers turned-in early, like Kimi and Fernando, with delicately-small initial steering inputs, but Nico (below) did so from about half a metre further to the right, giving him a slightly shorter corner. This he managed in Prost-like fashion, never looking unruffled or out of synch. Lewis (below) was thus a tad less impressive than Nico through this section of road – which, for me, was a surprise, I have to admit. 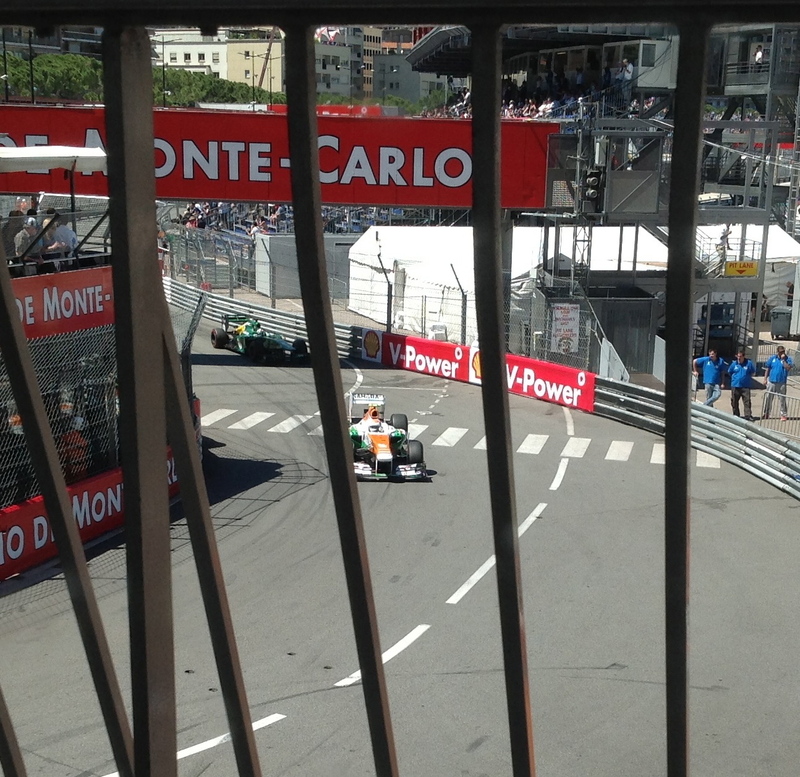 Part 2 of our views from Rascasse, featuring the remaining cars on the grid, will follow shortly. Silverstone and that dramatic escape behind him, Jim Clark returned to the cauldron they call Indianapolis, this time residing at the Speedway Motel. He and Dan Gurney were ready to roll on Monday morning – and to apply, therefore, the finishing touches to their all-important qualifying attempts. 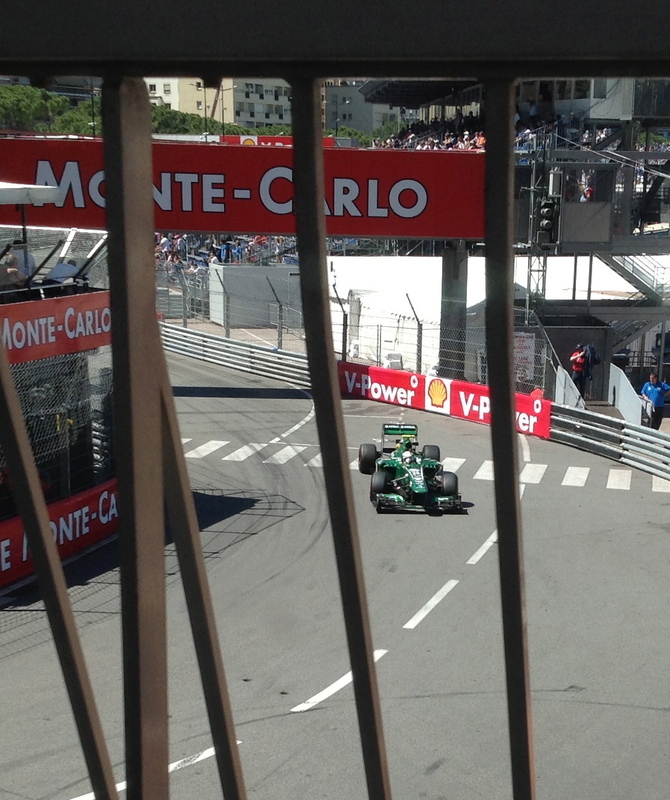 If they didn’t make it on this first weekend there would be no Monaco Grand Prix. It was as simple as that. 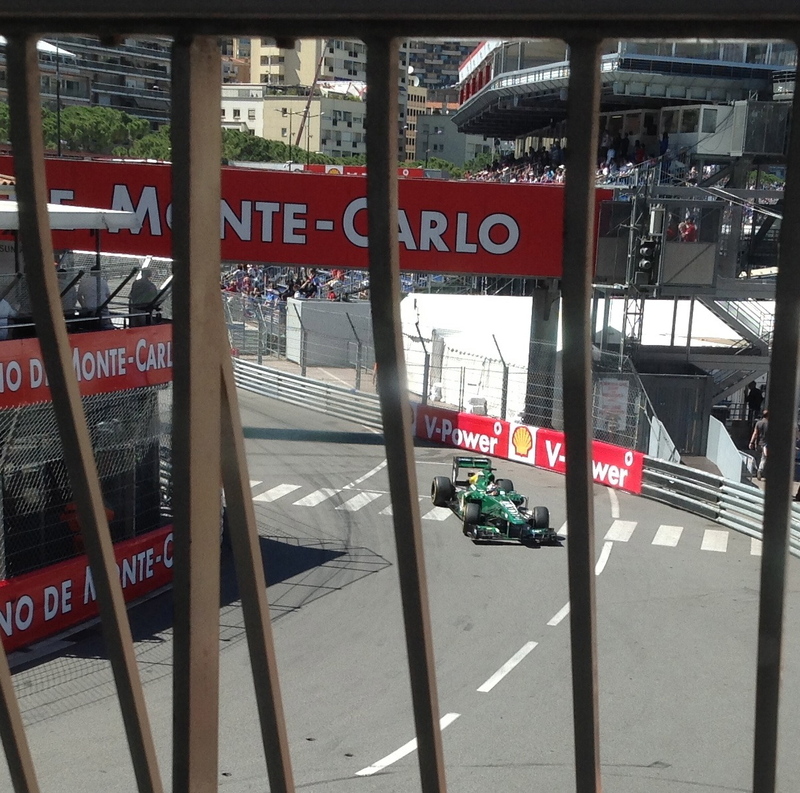 And if there was no Monaco Grand Prix, Jim Clark’s 1963 F1 season was going to become unnecessarily tough. After losing the title in 1962 by a single point, and now having won Pau, Imola and Silverstone in quick succession, he was keen to keep the momentum going. Jim was delighted to find that Hinchman and Bell were true to their word. His brand new overalls were, he thought, a little on the gaudy side – but this was Indy; and the race suit, critically, met all the USAC regulations for flame resistance. Hinchman didn’t seem to be in the business of two-piece suits (of the Dunlop type to which Jim was now accustomed), so this one-piece overall featured a neat little belt with a silver clip-buckle. Once he’d decided that regular shirts and pullovers were a little too casual, Jim had never worn anything but blue Dunlop overalls – first in one-piece form and, since 1962, with a separate topped tucked into the leggings. Now, as he tried on the Hinchmans for the first time, he saw in the mirror a completely different person. The shiny overalls were a base primrose-yellow with mid-blue stripes down the arms, pin-striped in red. There seemed to be no logic to the colours but he liked them all the same. His name was embroidered at an angle below the left chest zip pocked and on the right side was a Pure logo. Jim shrugged and packed the suit into his Leston bag. He’d wear it in the car but, between runs, he would change quickly back into his sea-island cotton polo and slacks or perhaps his shirt and tie. He also found a new Pure jacket waiting for him in his hotel room. He liked it. It was dark blue – his colour – with blue and white cuffs and collar. Very Border Reivers. And the Pure badge was neat and tidy. Without even thinking about the implications for Esso, he decided then that this jacket would not only be useful at Indy but also in Europe. The new Bell Magnum felt only slightly heavier than his Everoak but was considerably thicker all over. A neat white peak was clipped into place by four big studs – a significant improvement over the strap/stud arrangement that had caused so much trouble at Spa the year before, when the peak on his Everoak had been blown loose by the rush of air at high speed. Problem was, the Bell was finished in plain silver. Jim wanted to wear it right away, enabling him to get used to it in the build-up to qualifying. In the meantime he would see if Bell could prepare another Magnum in dark blue. It wouldn’t be ready for qualifying but he’d be able to take it back with him to Europe to use at Monaco. Jim was amazed by the size of the crowd at the Speedway that Monday – and in the days that followed. More and more, he seemed to be in demand. Whenever he was in a public area they jumped on him for autographs and in Gasoline Alley the media were all over him. 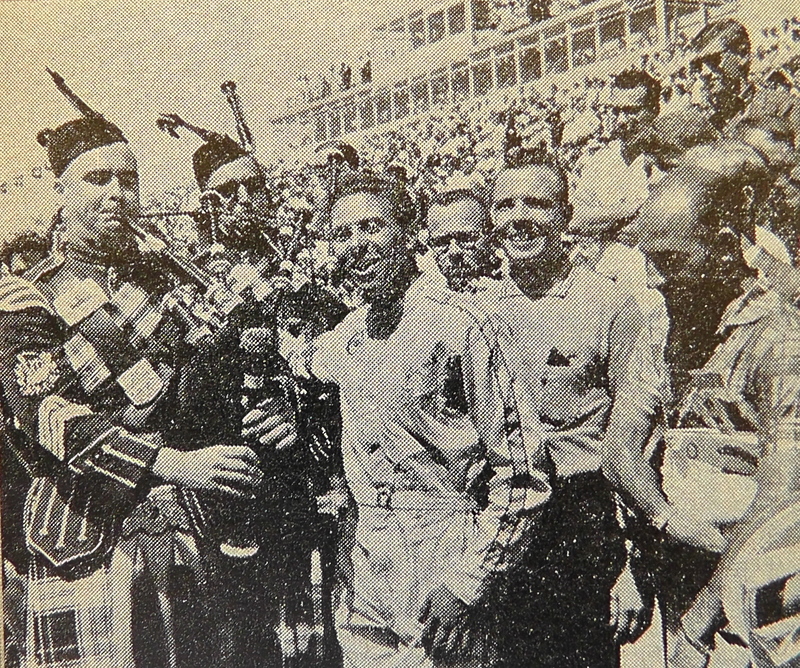 For the perspective of a fan at the time (albeit 1966), read Don Fitzpatrick’s comment associated with our 1963 Silverstone International Trophy report. 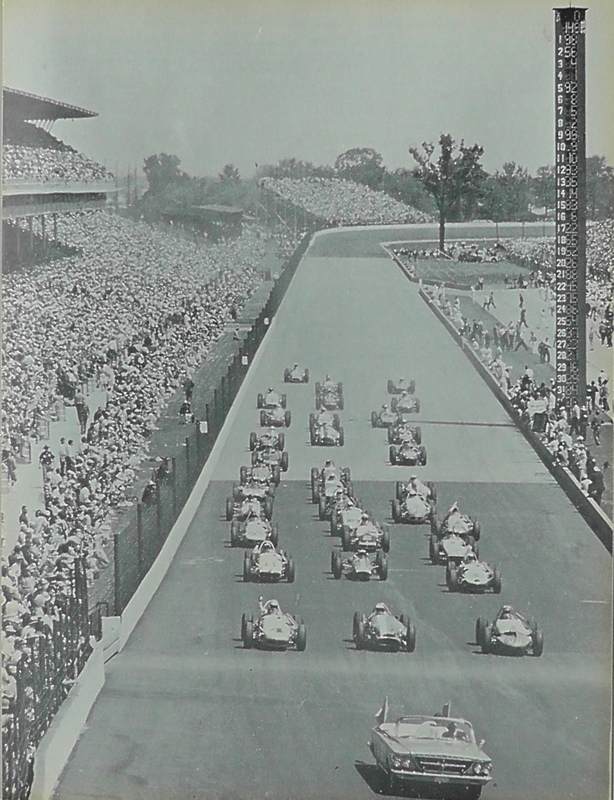 There was a shortage of Halibrand wheels at Indy – itself a function of the trend-setting 15in Firestones being run on the Lotus 29s; Dan, not completely comfortable with his set-up, spun his blue-and-white car into the wall; and the wind gusted up as Jim’s qualifying run approached: it was tense and it was time to go to work. “On the day of qualifying there was a fair-sized wind blowing at Indianapolis. I knew I wouldn’t get another opportunity, and, though quite a number of cars had been out and had failed to qualify because of the conditions, I had to make a real effort. “It was a tense time, with the wind blowing in 35mph gusts and the car was very twitchy indeed. Three hours previously I had been going around pretty steadily at about 151.5 mph, and Colin timed one lap at 153 mph; but these speeds were not possible when I went out for the official trials. “Dan’s practice crash had caused some embarrassment, because he wrote-off two of the wide-rimmed wheels I was due to use on my car for qualifying. So I did my qualifying with none of the rims matching – two wide ones on the outside wheels and narrow ones on the inside. “Anyway, after a few minutes of gritting my teeth and fighting the wind gusts, I eventually managed to qualify at 149.750 mph, which put me in the middle of the second row. You know, it’s amazing what a difference the track temperature and air temperature make to lap speeds at Indianapolis. I went out one day and couldn’t do anything better than 148 mph. Colin was trying to sort out the reason, and though he did everything he knew, the car just couldn’t be got round any quicker. We realized later that the speed was being cut by the heat, and we also realized that at that time all the other drivers had parked their cars away and weren’t troubling to go out. Local knowledge does help! 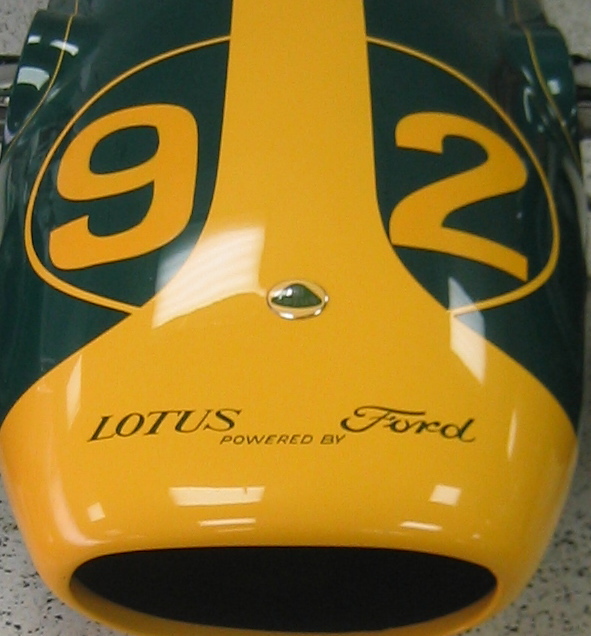 Jim had made it – and so, in the spare Lotus 29, painted in Jim’s green and yellow colours, had Dan. They could relax. And they could begin the rushed trip, with Colin, back to Europe. 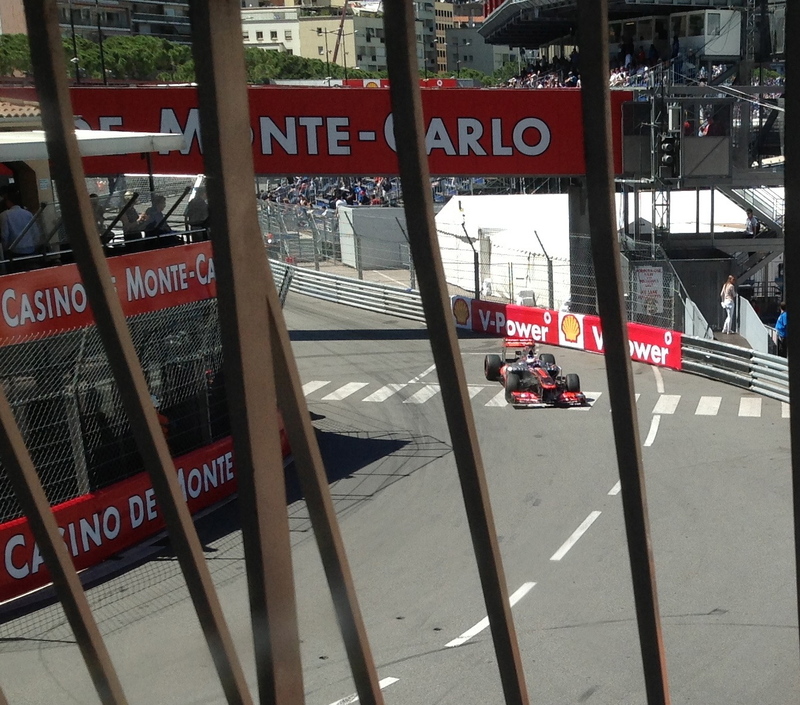 Practice for the Monaco Grand Prix would begin on Thursday, May 23.